These vintage English garden forks are well balanced, a pleasure to hold and sturdy enough to last a lifetime or two. The business end of each fork is made of iron, lightly rusted through the light and dark green paint. 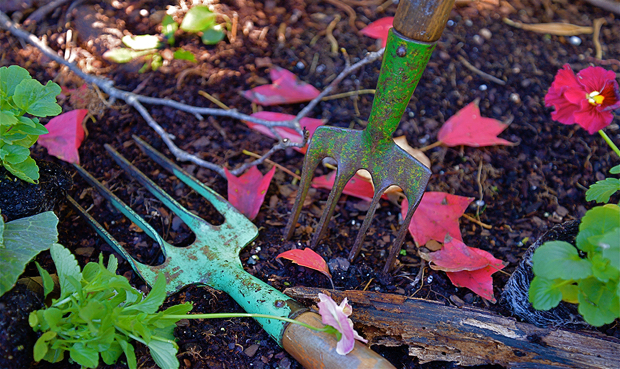 Notice that the tines are slightly twisted for better loosening of the soil–perfect for digging kelp into the earth around your antique roses, or for planting pansies to brighten your autumn borders. The handles, one long and one short, are smooth wood, with the kind of soft patina that comes from daily use by a devoted gardener.